ï»¿ Keighley and District Model Engineering Society. Minature steam trains, model yatchs and model boats.What we do in the winter. Bert Gavins founded The KDMES on the 6th June 1950 with the help of a few others who are no longer with us. He was elected President in 2007 in recognition of his contribution to the society. 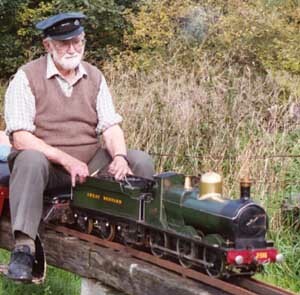 He built a Black 5 in 3.5 inch gauge to Martin Evans' design, and a Dean Goods in 5 inch gauge from measurements he made from a full size version. This is the loco in the picture to the left. He was still a regular driver at Marley in his 90's and also helped with our portable track events. Bert was a brilliant self taught model engineer, and an expert builder of steam injectors. He supervised boiler tests for many years. Bert also built a 1 inch scale Traction Engine and numerous canons which were shown on the club stand at Harrogate. Along with these he also built a working model medieval clock. Bert passed away on December 6th 2015 aged 97 years. Our roadway was washed out with the floodwater escaping from the football pitches. The council who owns the road came along with several lorry loads of tarmac scrapings. This is the way the water went to the river Aire. Battens on the walls for the cladding finish. Both cubicles are being refurbished. Guess this is the little boys' room then. Trial fix of the panels. Panels in place. Looking smart. And the right hand cubicle. Keith and Vic finishing toilets, May 2016. The Gents' (and little boys'). Refurbished toilets May 2016. View from the door. We got the trolleys out in the sun. We have put them up for sale. These passenger trucks are the replacement ones new to us. Keith giving the trucks a fresh coat of paint. New trucks ready to roll. One of the old trucks being remade for the portable track. Track maintenance on the first curve by replacing a sleeper. One of the containers is to be replaced and then both will be turned through 90 degrees, so we barrowed and tipped rocks to widen the roadway behind the containers. We had to wait for the ground to dry out before the lorry could deliver the replacement container. New container flies through the air. A bit of a shove and it's in position. The inside of the container was fitted with storage and a lifting system for new trucks. It's now easy just to roll the trucks out. No more lifting! Keith painting the new clubhouse inner door. Alwyn making the essential tea and coffee. 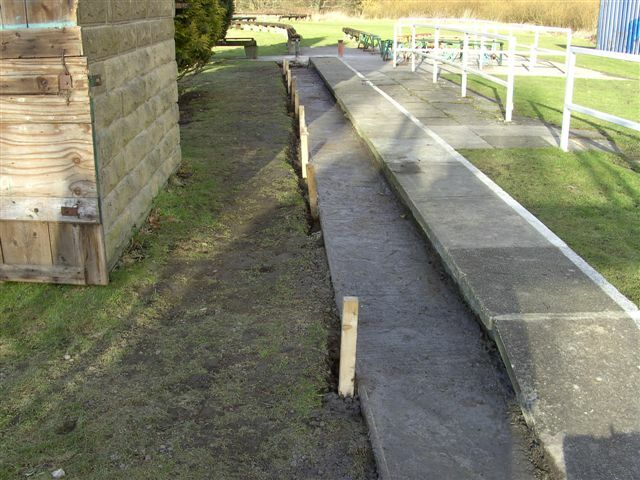 The work this year is to replace the track supports and sleepers by the car park. The first job was to clear away the fencing posts on the river side of the track so we can get the mower round in the summer. Hopefully it will be easier than strimming. Having dug some square holes in the ground it was time to fill them with concrete. It took several mixer loads to fill each hole. So we kept on mixing concrete. That's a couple of concrete bases done. The concrete bases are finished, so it's time to sight a level to find the heights of the supports. Having measured the height of each support it was now time to weld a top and bottom to them. Always handy to have a hammer for making adjustments. Do you think it will be ok without the sleepers? Drilling the holes to fasten the pillars down. On and off with the sleepers, but at least the pillars are fixed. Nearly ready to bolt the sleepers on. The end one needs a trim to level with the station blockwork. Only needs the track now. Nearly ready for the trains. Job finished and ready for trains again. We also got the portable track out to be sent away for some welding. When it came back we gave it a coat of paint. First Gala for the portable track at Riddlesden. First Grass Cut of the Season. And we also did a bit of heavyweight tidying up. Track has been remade on the section just before the swing bridge, but the wet weather has encouraged us to improve the looks of the inside of the club house. Trying to make the bridge vandal proof was the first job in the autumn. Here it is with new steel joists and foot treads. A different view showing the steel work still in undercoat, (difficult to paint in the snow). The remaining supports from the old steps going at right angles yet to be removed. The anti tipping rail along beside the track can be seen. Mixing cement for blockwork extending the platform. Longer shot showing activity to get things back together at the end of a session. View from the bridge of a good morning's work. Work has been progressing on track renewals. The major activity has been on the curve immediately after the tunnel. New concrete bases have been cast for the track support piers. This view is looking back towards the tunnel. A closer shot showing the concrete trusses that are being tried on curves instead of old railway sleepers. Setting a long distance level. Setting the level of individual trusses. Concreting in between the trusses. Painting the railings round the station. The water tower has received new cladding as part of the works from the generous grant received last year. During the winter track renewal is taking place at Marley. 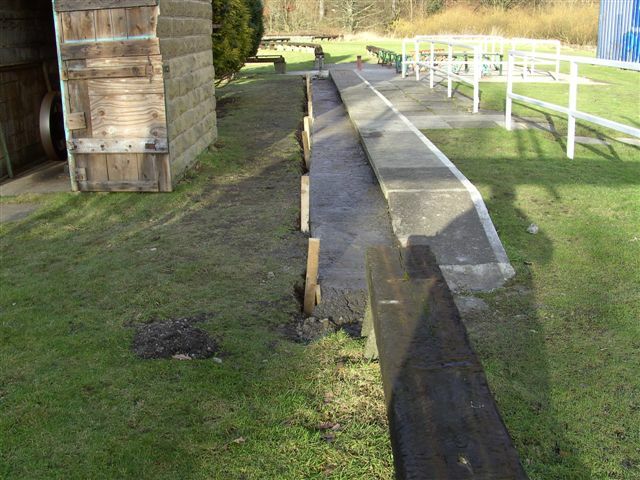 On Wednesday and Saturday mornings work is taking place to renew 70 meters of track along the 'back straight'. The photographs below will tell the story when we remember to take them! And this is how it looks as the grass is starting to grow back. Other work was done around the site as well. The bridge was cleaned of the rust and old paint and given a new coat of paint. The job was finished off with new handrails. This page was last updated on Friday 10th July 2016 at 14:00.